The source code to accompany this post can be downloaded from http://public.me.com/stefsewell/ from the TechEd2010 folder. The sample code is in the archive ServiceAuthoringSample.zip. A service is simply a piece of software that provides some functionality, access to this functionality is formalized into a contract. A service is often hosted in a separate process and utilized by a number of different consumers. The service does not know anything about the consumer, it just performs some work on their request. Between the consumer and service is most likely a process, machine and possibly a network boundary, therefore any data to be exchanged must be serializable. For the consumer to call the service, it must know where it lives, therefore the service has an address. The consumer must also be able to understand and be understood by the service, the supported communication protocols are captured as bindings. So there we have the ABC of Windows Communication Foundation; the Address, the Binding and the Contract. There is a single method that takes a string containing a question and returns a string containing the answer. The System.ServiceModel namespace is the hint that we are going to use WCF to take care of our service. To provide an implementation of the service we have the following code. 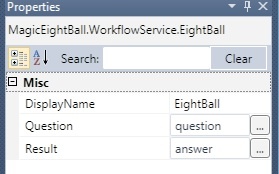 The eight ball is captured as a simple class with a Shake method, the service is not enforcing any validation such as ensuring a question is asked to keep things simple. Note that there is no System.ServiceModel using statement, this is vanilla .NET. We have a service contract and an implementation, our coding is complete. The next step is to host the service and allow our consumers to call it. The service host can be implemented in a number of ways, for this example we are going to use WAS (Windows Process Activation Service) which uses the IIS infrastructure to host the service – we don’t need to write a host, we’ll just use one that Microsoft provides. To access the service, the host exposes an endpoint, the endpoint is composed of the address, binding and contract. One of the criticisms of WCF in .NET 3 was the steep initial learning curve required to get a service hosted and configured. In .NET 4, the idea of defaults has been introduced which greatly reduces the amount of WCF configuration required to get up and running (to the point where it is possible to have no explicit configuration). In the example below we have a little configuration due to a slightly non-standard approach. The service reference needs to know the address of the service and then from the metadata it creates a class, the proxy, that allows the project to make use of the service. 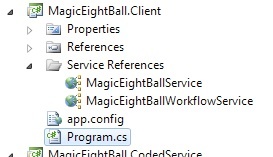 After clicking on OK, the service reference is listed as part of the project, in the sample below the MagicEightBall client is making use of two separate services. 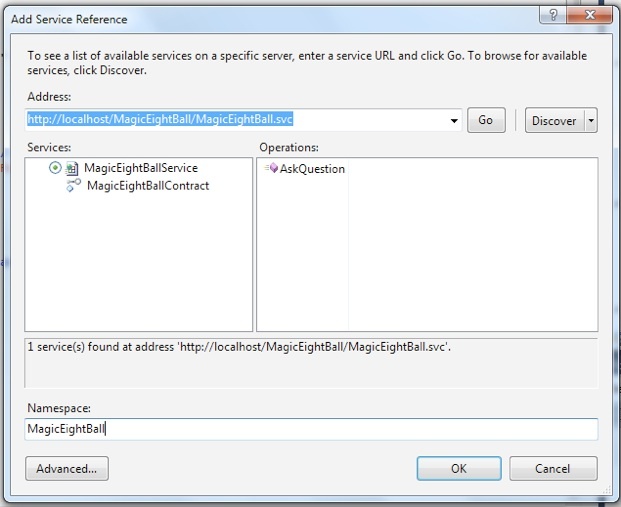 A dialog pops up asking from a location to publish to, I used http://localhost/MagicEightBall which set up a new web application in IIS. By default the web application is set up to support the http protocol. If you want to change this you need to alter the ‘Enabled Protocols’ in the Advanced Settings dialog which is available from the web application context menu in IIS Manager [Manage application | Advanced Settings…]. In the example above I added the net.tcp protocol in addition to http. Note that there is no space between the comma and net.tcp. Putting a space in here will break the enabled protocols! Now we have created and published a WCF service, to test it, point your browser to http://localhost/MagicEightBall/MagicEightBall.svc. You should see the standard metadata page for your service instructing how to create a proxy class and consume it. In total there is less than 30 lines of code required for us to write to define, implement, host and consume a WCF service. This activity is essentially the same code as the Eightball class in the original service. The question is captured as an InArgument to the activity and the result is a string, specified as a CodeActivity. Note the use of the CodeActivityContext to get the value of the question from the workflow runtime at execution time. Here the receive activity expects to get a string parameter called question which is mapped to the question variable we created earlier. 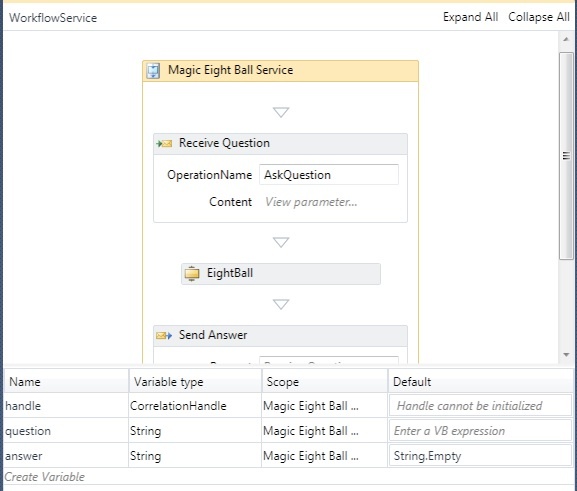 The receive/send activity pairing is analogous to the AskQuestion method in our coded service. 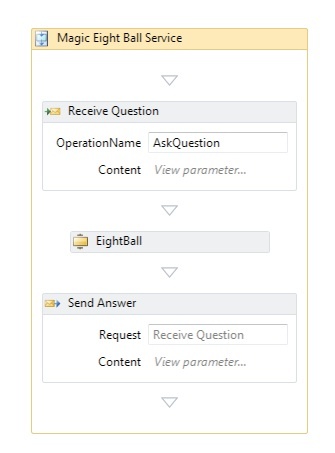 The send activity returns a string and is paired with the Receive Question send activity as shown in the Request field. Here we are returning the answer that we got from the EightBall activity. This workflow is now functionally equivalent to our original coded example: a string containing a question is passed in, a string containing an answer is returned. To host the workflow service, the same steps are taken as before. You simply choose to publish the service from Visual Studio into IIS. The service exposes metadata in the same way as the coded service, therefore you can as Visual Studio to generate a service reference for you and then consume the service in the same way as we did for the coded service. So we have two ways to solve a problem – which is better? It depends on the work that the service is performing. If the service is co-ordinating work across multiple services then a workflow makes sense as it can be easier to visualize the intended flow of control. If the service co-ordination is long running and needs to be persisted then again a workflow makes sense as this long running, durable capability is built right into the workflow service host that Microsoft ships out of the box. The sample code contains some additional concepts not discussed such as a separate activity library and instrumentation options for service code. The code is small and so hopefully this does not clutter the examples too much. The simple as answer is that you recompile your source under .NET 4 and you should be done. .NET 4 is backwards compatible with .NET 2/3.X but you need to recompile for the new CLR (common language runtime).